Albanian lobbyist Joe DioGuardi stands left of McCain. Americans of Albanian heritage collected a million dollars in one evening for the presidential campaign of Republican Senator John McCain, said the Albanian American Civic League yesterday, the lobby group headed by former Congressman Joe DioGuardi. A reception for McCain was held January 22 at the Saint Regis Hotel in Manhatten, and the senator, who is now leading in the runoff for the Republican party candidacy in the November elections, cut his campaign in Florida by one day to attend this gathering. "Even in 1998 when we had problems with Milosevic, McCain did everything that we asked of him to the benefit of the Albanian people, including arming the KLA", announced DioGuardi. "We are American Albanians and we need a leader who will strengthen this country... We must support John McCain because he did everything we asked of him for Kosovo, from supporting the Kosovo Liberation Army to supporting the independence of Kosovo. Two years ago he spoke in Brussels and said that independence is the only solution", concluded this former congressman who has been fighting for the independence of Kosovo and Metohija for more than twenty years. He explained that the first thing McCain said to him when he entered the hotel in Manhatten on January 22: "Joe, I saw your people in Michigan, and in South Carolina and in New Hampshire", from which this lobbyist deduced that all Americans of Albanian background will be voting for the senator from Arizona. DioGuardi and his wife Shirley Cloys-DioGuardi have been friends with McCain for years, and he intervened several times in the Senate on behalf of the Albanians. Because of that, the Albanian American Civic League awarded him the "Balkan Award for Peace" a year and a half ago, and the initiative was the proposed Senate resolution - which McCain wrote - in which thanks is extended to the Albanians for "saving all the Jews who lived in Albania or who sought shelter there during the Nazi Holocaust". 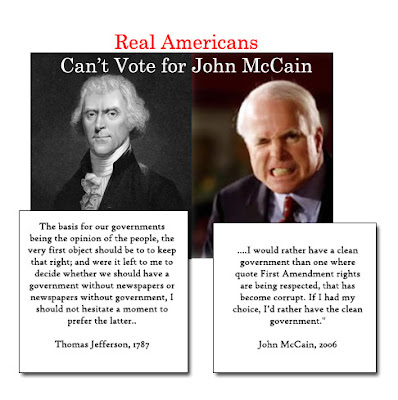 However, even though he is leading in the presidential nomination, John McCain has not yet succeeded in convincing the primary wing of the Republican Party - the conservatives - that he is the right candidate. One of the reasons is that he often spoke and voted against the majority Republicans, as in 1999 when he asked for more intensive air bombing of Serbia. In April of that year, three weeks after the bombing commenced, he announced that the US is in danger of losing the war to the Serbian Army which has "antiquated machinery" and "absolutely no military air power", if massive strategic air attacks are not initiated. "Attacks on any infrastructure target must not be prevented. We all regret civilian losses, as well as our own, but they cannot be avoided," he said. During the pre-election campaign in February 2000 at a meeting in Manhatten, John McCain asked for the release of all Albanian prisoners in the prisons of Serbia proper, and a year later he used his inlfuence to ask the administration for an urgent investigation into the killing of the brothers Bitici who were taken from prison and killed in the police training center in Petrovo Selo in eastern Serbia. This February 5 the senator held another meeting in Manhatten and in the public there was a visible Albanian flag.